The knowledge from the archaeological excavations provides an extensive informations about how our ancestors lived, how the human civilization flourished, its achievements not just over the centuries, but millennia. The degree of civilization development depended on the climatic conditions in which a given ethnos had to live. There was not a difference between homo sapiens of one from the other ethnic groups in their development, there were no genetic impairments. Terms of everyday life, the seasons, played an important role in the needs of daily life, and the whole life was appropriately shaped, depended on its conditions. It is clear that the Greek when relocated into the harsh northern Europe conditions, would have never easily managed with the Baltic sea envirement - but surely much easier would be for the Prus in the reverse. The knowledge of the Prusai ethnos is insufficient , we need all the branches of science to identify their origin, existence, customs, morals, and who were the inhabitants of the Prusai land. The archaeological excavations draw the attention to the only physical surviving knowledge of the Prusai. Excavations carried out in the various distant geographical places from each other, their findings are appropriately analyzed, arranged and finally described as the cultures. In those bygone days, people lived without established borders, there was no definition of a nation or a state, the only identity was their culture, it was the demarcation, the boundaries of each ethnic group. 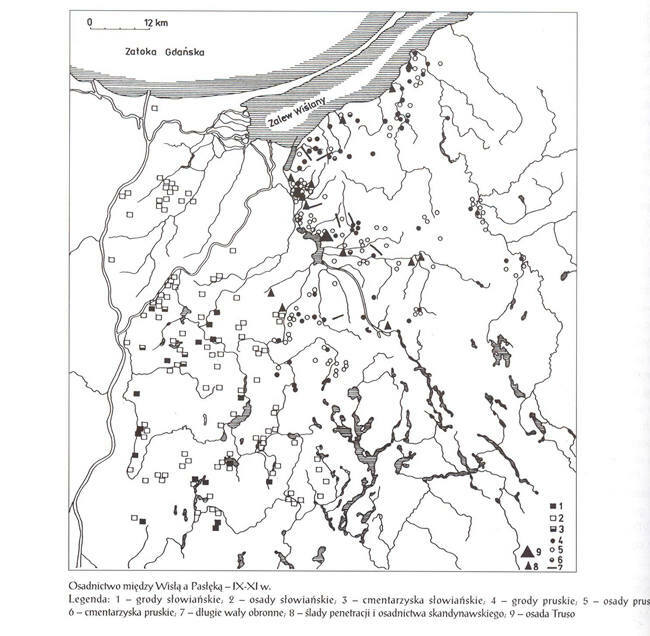 On the Prusai territory there are determined two specific cultures, the pre-war excavations at Oksywie - "oksywska" in what now is Gdynia Oksywie, followed by Wielbark - culture "Wielbark" near present day Malbork. These characteristics include the area of Pomezania and Culmn land. Cultures, Wielbark and oksywska are attributed to Celts, their influence on the culture of the Europe, civilization is compared as an equal footing with the cultures of Greece and Rome. The era of this culture, its origin is attributed to the short time before the onset of AD. To the east of Wielbark culture, remains small territorial emptiness followed by the culture of Western Baltic Mounds, north of Mazovia, Mlawa heights to the Suwalki region and ending in Sambia (today's Kaliningrad region). Traces of it are met in Russia, river Dniepr and attributed to the fifth century BC. To the ethnos of Western Baltic Mounds culture, not much can be said. Generally can be pointed out to the Indo-European origin - as shows the genetics, and still remains the question whether they could be the Sarmatians from Scythian formation, by the ancient historians said as Aesti. It is easier to speak for the Celts. According to the Gothic historian of the sixth century AD, Cassiodor, Goths were already present, in the year 1490 BC, at the settlement of the lower Vistula and on the island at her mouth. Maps of this period of time were not available and the geography of the region has not yet been known. The closest, distant island in front of the Vistula mouth, and as the name suggests, could be Gotland. In consequence of overcrowding the island was left by Ghots, in fact the reason for leaving was not over population - but the lack of food, that they returned to Pomerania to their Gothiskandza. Scandinavia has never been a land of milk and honey, and on the contrary - has always been very poor. In contrast to the Pomerania, where plentiful and it was easy to acquire the necessary food to stay alive, and above all, was not populated. The Gotland after depopulation, at first was with kuronian pirates and after had many owners, at the end of the fourteenth century was conquered by the Teutonic knights, resold to the Danes and finally passed into the possession of Sweden. These two archaeological cultures, although started separately its existence, territorial proximity decided on their common interests. In the map below, will notice that there is a lack of the Prusai tribal names, which have been only later imposed, during their conquest. The people that settled on the coast of the Vistula lagoon, were called Widiwarians. In these numerous settlements, fishing was a secondary occupation, the settlers were involved in the craft and trade - as it was walking route along the coast of the ancient amber trade routes to the southern Europe. These settlements already existed at the turn of our era because of that time in Greece and Rome not only already been the knowledge, but the desire for amber was in a great demand. Indication on the map of the Slavic settlements, is rather a fantasy combined with Slavic patriotism. This map shows the period when the Goths were already divided into Ostrogoths, Visigoths and Gepedoios (Gepids). Ostrogoths settlements in Pomerania were already empty - they have gone helping Visigoths in conquest of the Rome. Gepids stayed on, and they were the Celtic ethnos of the Prusai, who participated in the amber trade with the southern Europe. The Prusai of the north eastern Europe throughout their period of stay, they were second to none in the trade dealings - they were the vanguard of the commerce, not only with the then ancient world, but also with its nearest neighbors on the land and at the sea. Despite the harsh climate, nature gave them great diligence, which secured them against hunger in agricultural crops, vegetables and animals farming. They lived in the land that was rich in game, the forest fruits and the lakes were abundant in fish. Nobody was starving and there was no beggars. 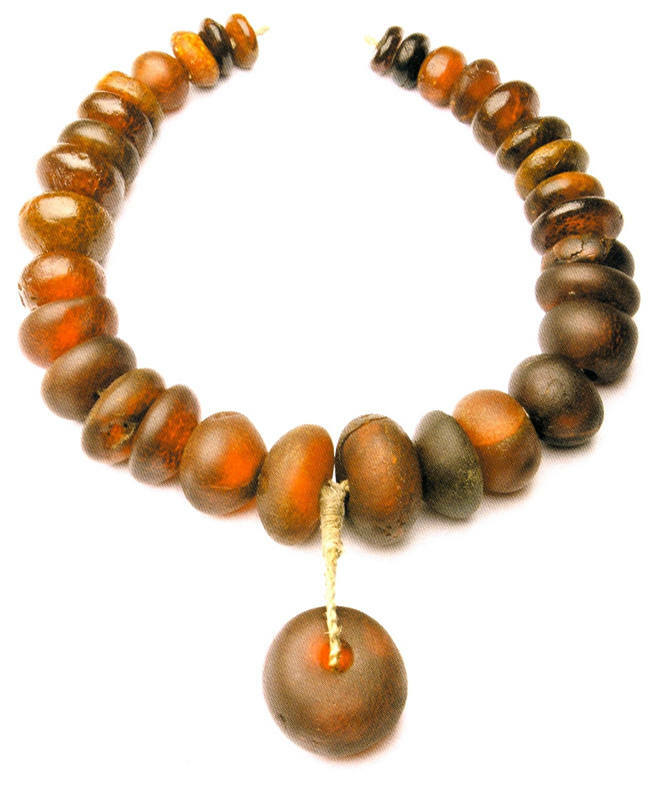 The richest Prusai province - Sambia, possessed at that time a very desirable amber, that in the ancient Europe made the Prusai land famous. 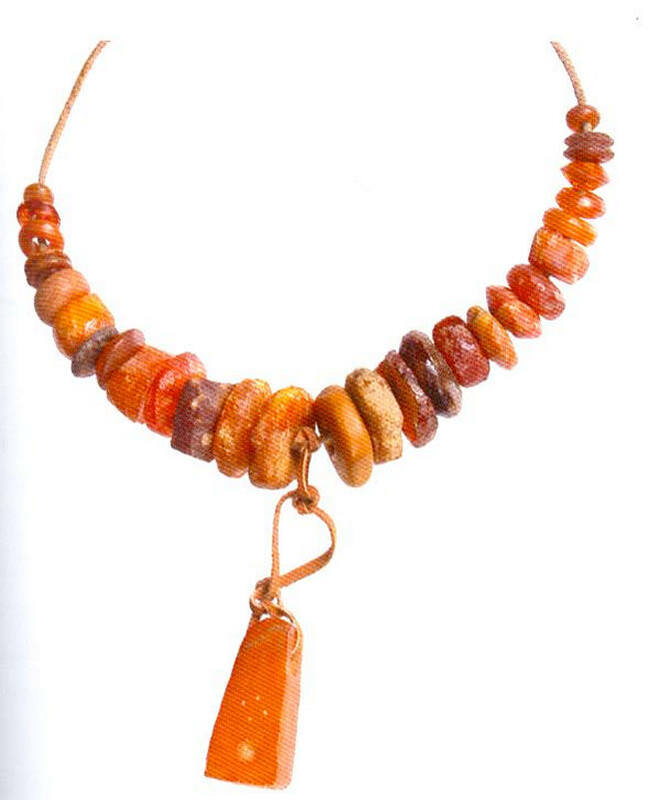 In Greece, amber was called the electron and of this comes today's name of electricity. Not only that: there was the legend of Jason's expedition for the golden fleece, until today remains unexplained. All the ancient gold mines were very well known. This journey into the unknown, was it after the gold of the north - amber? The Roman Empire was remaining not far behind the lust after amber and it is through these settlements on the Vistula Lagoon, the Prusai amber was passed to Rome itself. There was a great demand, the Romans themselves as Jason personally organized the trip after this commodity. 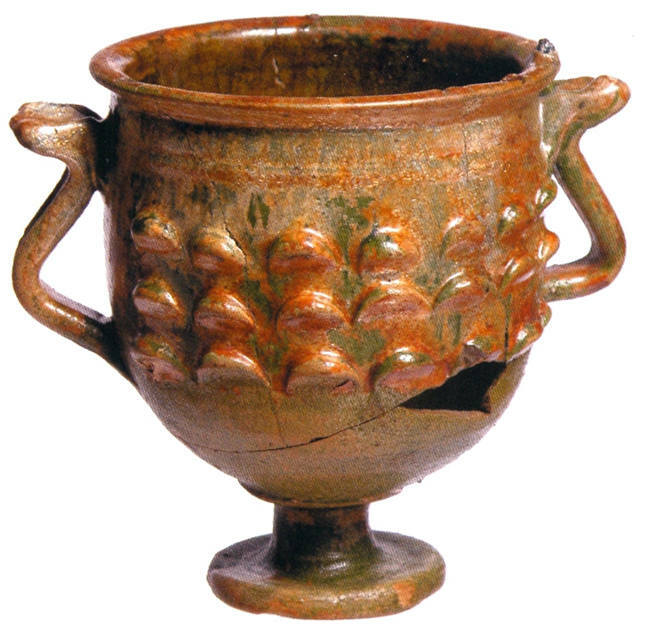 In return, the Prusai imported goods and products from the world of antiquity-yet unknown to them, at the same time learned a new and different cultures of Europe. Amber trade route ran along the lagoon by the current Poland then still not Slavic, through the so-called the Moravian Gate and to the south of ancient Europe. 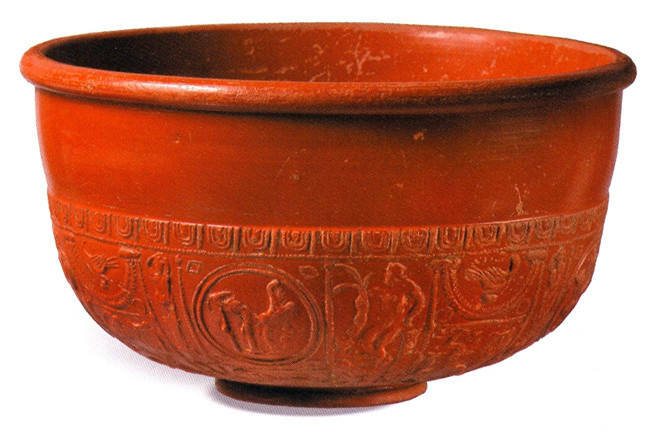 Terra sigillata (clay stamped) - Roman type, manufactured in Italy from the first century BC ( called Arretine Ware), and at the same time in the provinces, especially in Gaul and on the Rhine, characterized by red colour and glazed, sometimes also called Samian Ware ceramic. Dishes were often decorated with reliefs, although there are also smooth forms. Commonly occurred in the area of the Roman Empire, and as can be identified the place of manufacture and the exact chronology, they are useful for dating from this period other archeological finds. The second Prusai commercial trail led from Sambia along the watercourse of the river Niemen in the direction to Rus, the Black Sea, Byzantium and thus to the ancient world of Islam. All of this is documented in the archaeological finds. 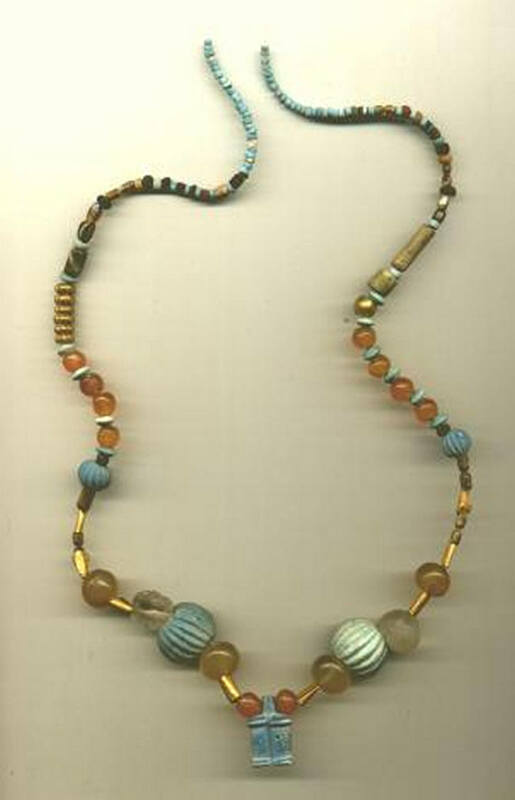 Necklace with Arab coins, find in the Wiskiauten (Sambia). Sambia with the port settlement of Wiskiauty - a commercial center , located at the mouth of the river Niemen to the Baltic Sea. From the Wiskiauten by land went caravans of traders into the Rus followed the waterways toward the south, the Black Sea to the Islamic world. In front of that port from the side of Baltic sea, at the bend of the river Niemen, recently was discovered the Kaup graveyard with heavy arms. The settlement was a protection from the Baltic Sea pirates. 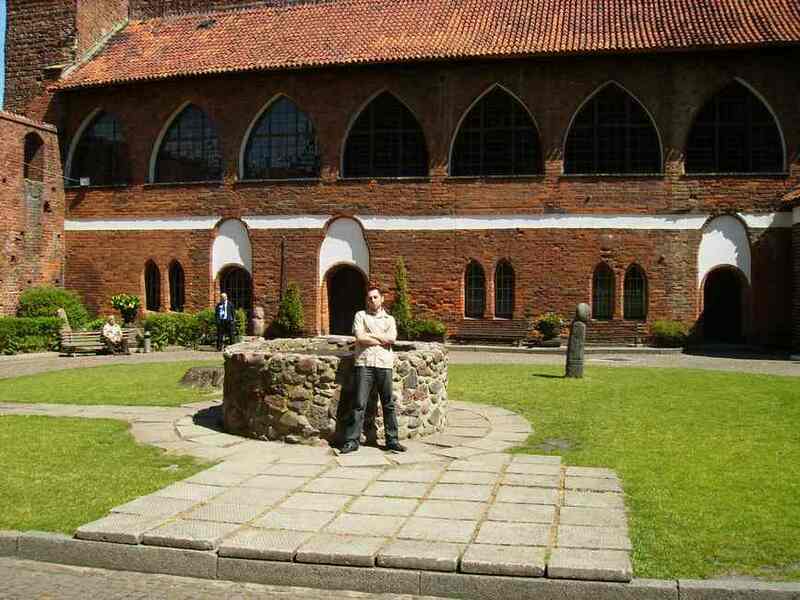 Similarly to Jomsborg, militarily secured the peace to trade at Wineta-Wolin. To authenticate this, to this day in Novogorod, in the heart of the ancient city of Russia, is a Prusai street - there it was in the first millennium. The city was not set up by the Prusai, the street presence provides an evidence of their exceptionally strong trade position in Russia. Important, noteworthy to underline and for the attentione ought to be, that the Prusai never ran aggression, expansionary policies in relation to their neighbors, and their territory stayed unchanged or augmented. The travelers, merchants, spies, missionaries arriving in peaceful mood, were received by the Prusai with a great hospitality, and their merchant offers were always rich in goods, at the other Baltic ports their arrival was always attached with great attention. Traded in leather, furs, which were provided not only from their native land, but also brought from Russia. The same merchants when saw news on other markets were brought to their workshops, as well as encouraged other talented artisans to come and settle with them by offering them incomparably better living conditions. The Kaup cemetery, with discovery of numerous arms indicates that the place was a stronghold for the defence of free trading in Wiskiauten. The Baltic Sea at these times was very dangerous with the marauding kuronian pirates. Those were the times, but still without the Vikings and the Scandinavians they were in their diapers. In addition to numerous weapons, a very important Kaup finding was a granite stone engraved with the trident dating from the period of VII / VIII century, without denial it becomes a fact that the settlement of Kaup had been much earlier in the respect to others places on the Baltic sea coast and the same applies to the Wiskiauty port. This finally proves that both ports Wiskiauty and Truso were the first settlements in the Baltic and neither the Skandynavians or the Vikings did have anything to do with setting them up. 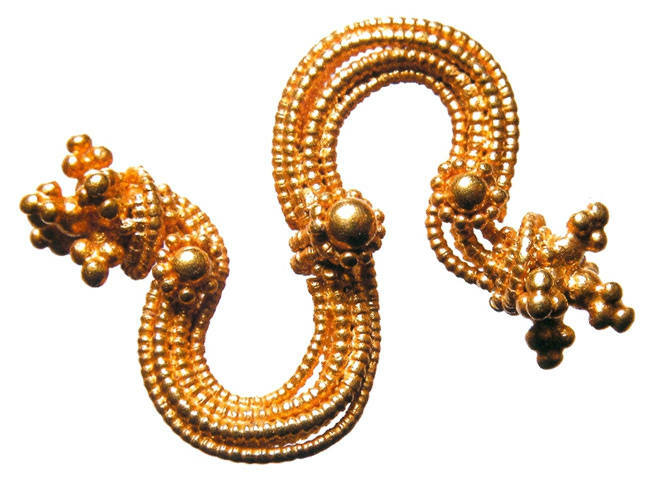 The Kaup trident discovery is a monumental one for the Prusai, providing a great deal, it is the oldest symbol that we know and it is additional proof of their active presence in Russia, because similar discovery was unearthed in the region of Smolensk and Czernychowo, of a later period X / XI century. Following this, we know that Vladimir Rurik after the conquest of Kiev at the end of the tenth century struck the gold coin with the trident, which became the emblem of Kiev, and today it is an emblem of the Ukraine. The trident pedigree comes from the Prusai land, and the Scandinavian’s Rurik origin is overthrown by the current genetics researcher, that indicates their Jatviagan origin. The Jatviagan descendant living in Poland, after his genetic test has discovered that two thousand years ago he was related to Ruriks. Thus this is informations indicates that in creation of Kievan Rus actively participated the Prusai people of Jatviagans ethnos. The Baltic Sea commercial activity will be considered separately, as it is necessary to present other significant commercial ports located in those days on the Baltic Sea coast. The Prusai people not only that they were not alien to the sailing, but their activity on sea exhibited a great skill and were excellent sailors. It was proved during the Second Prusai uprising when during the siege of Konigsberg they defeated the Teutonic fleet. Also the adventure of the Prusai merchant Vidgautra proves a lot, when he took a refuge in the port of Hedeby on his drakka, running away from kuronian pirates. He had to have a much more efficient drakka and a great sailing skills as he overtook the professional-pirates to take the refuge in Hedeby. 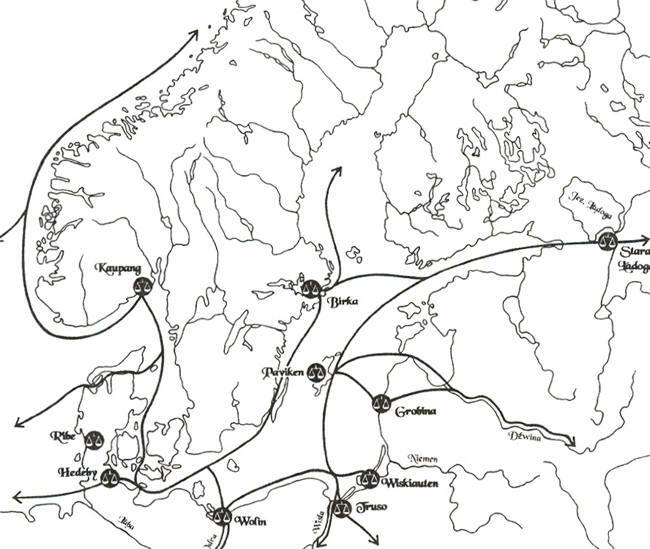 Ports and trade routes in the Baltic Sea basin. Wiskiauty and Truso the Prusai ports , at a small area, suggesting that the Prusai ports were an example for the Scandinavians. 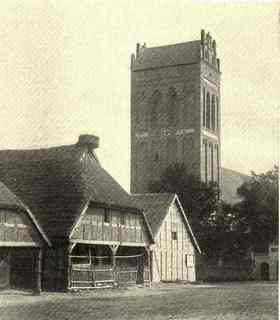 In today's area of Schleswig-Holstein was Hedeby harbour, at the beginning it was only a modest village, at the end of the second half of the eighth century settled with people from Frisia and Saxony. Undoubtedly, the port of great importance as it flipped goods from the north-eastern Europe, to the western Europe as well as indirectly from the Arab countries. Hedeby was a cluster of artisans from all over Western Europe. Former blacksmith workshops, glass, gold and jewelry product. Encouraged newcomers willing to settle for potential earnings, but it was not a place with milk and honey flowing. 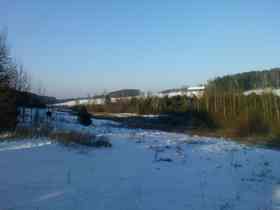 Around Hedeby was a complete waste and lack of agriculture, only fisheries addressed. The newcomer in the tenth century the Spanish from Tortozy reported of Hedeby: "The main food of the inhabitants is fish, because there are a lot out there," and life itself "poor in goods and riches." As a result of the invasion from Norway Hedeby about the year 1050 was burnt down, and by the Slavic trip the complete destruction was done in 1066. The second major Baltic port Swedish Birka, settlement was established in the mid-eighth century and abandoned in the middle of X century. It is unknown with what the Scandinavians were able to trade but it is said that along the rivers and lake Ladoga connection were getting them to Novogorod (with what?) . Further rumorers, were to Byzantium and to the Abbasids Caliphate. Not much is known about this port, adding only, that for the defense from the sea a wall was laid. 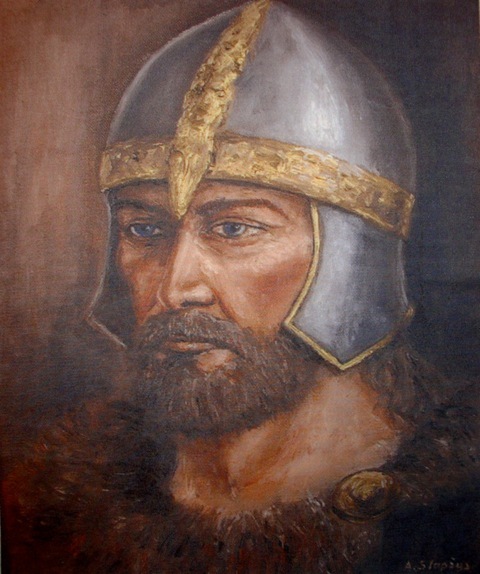 Could it follow that the Vikings defended themselves against the Vikings, the Polish scientists sure of, that they the Scandinavians and Vikings established the Prusai two ports. Agonizingly sad, but true about falshood. To continue, the attention will be devoted to the other Prusai port, Truso , strategically well located on the Vistula Lagoon and unaccesible to pirates. The Truso supposed to be started at the end of the eighth century and at the eleventh century ceased to be, and was a port of the Scandinavians and the Vikings. That is a complete nonsense. This theory goes completely untrue. Port together with a number of settlements on the Vistula lagoon existed much earlier, starting with the establishment of the amber routes. The Truso settlement existed from the immemorial times, the English traveler Wultsfan visiting her about the year 890 saw intensive craftsmanship and commerce, but did not note the presence of any Scandinavians or Vikings. 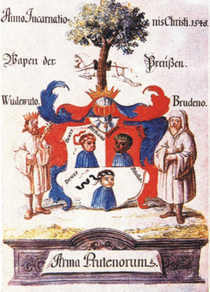 He stated that the lands of the Estians were composed of a number of smaller territorial entities of different names, including Witland on the Vistula basin and that the people of the Estians, apart with trading in amber, also offered skins and furs, “is very large and contains many towns”. The Truso port fulfilled two functions, in addition to the trade trafficking also crafts workshop in which not only the amber, including precious metals were used. This testifies unearthed balance with the weights. Prusai did not have the precious metals so with great probability the coins were melted. To the Prusai, it was not acceptable, that on their land a group of aliens from a foreign land assumed settlement or fortress. Attempts were, by the Danes and concerned mainly the coast line difficult to defend. Usually lasting very short time, until the Prusai organized the gathering of their forces and eliminated invaders. 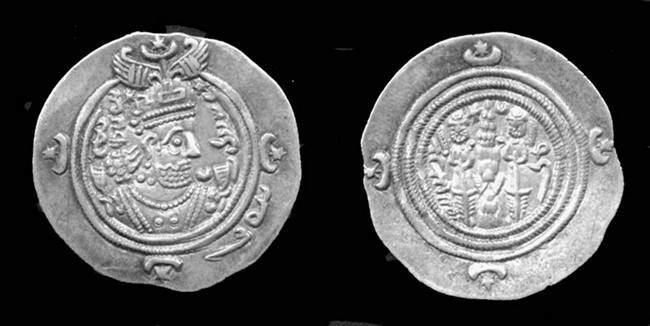 The Prusai land and not just the ports, has a countless number of ancient coins finds, particularly the Roman and Arabic, but not only. Abbasid dirham. Year 815-16 AD. Silver. Truso. Denarius of the Hedeby mint about 825 years. Denarius of the Hedeby mint, silver, early to mid-ninth century. English pens from Rochester mint of the Wessex Ethelwulfa king. Silver years 845 - 848th could have been left by some English merchant. English chronicles do not say anything about the visitors from Prusai. 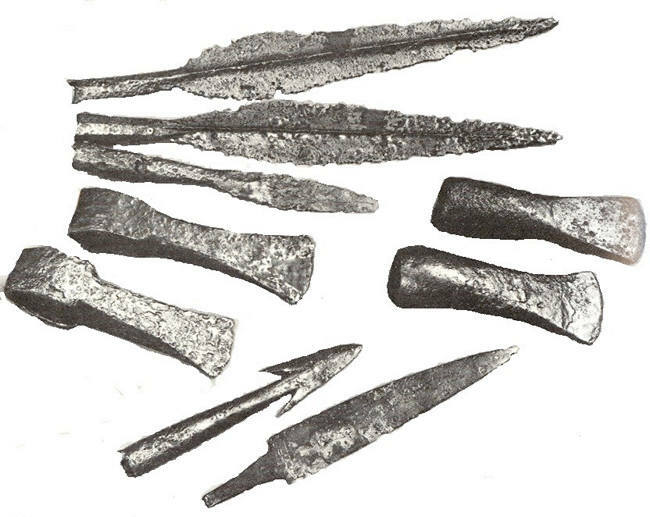 Throughout the Prusai land, not only in the ports, in various places, least expected once, countless coins were discovered from different parts of the ancient world and various dates often indicating the period in which the Scandinavians had just formed their settlements, should they know anything about the rest of the world, this was from the Prusai Baltic traders. If all this was in accordance with the idea of archaeologists they should also draw a new theory, that the Prusai were first world’s coins collectors, the numizmats. 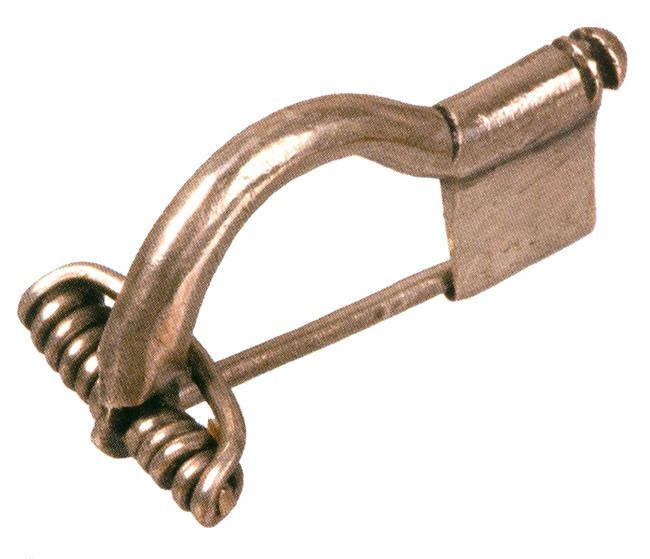 The Truso itself was the most versatile craft workshop: there discovered was metalwork, jewelery making, glassmaking, amber craft, marks loom, found the flat-bottomed boats of wooden belts combined with iron rivets. The basis for saying, that they were allegedly Skandinavian’s port, are on the base from totally unpreserved buildings, saying that their characteristic belong to the above, what the archaeologists could only find, darkened spots in the ground from rotten poles. So, to this fragile hypothesy and such a false theory was adopted. On the other hand, knowledge of the Prusai wealth as well as of their contacts with the south of Europe and beyond, have been very well known to the peoples of the Baltic basin, and such was their wealth, that they were the attraction for others. Claiming that Truso was founded by Scandinavians the same the Kaup - Wiskiauty is a fairy tale, a poor story even for children, single fact a Prusai street in Novogorod says for itself. 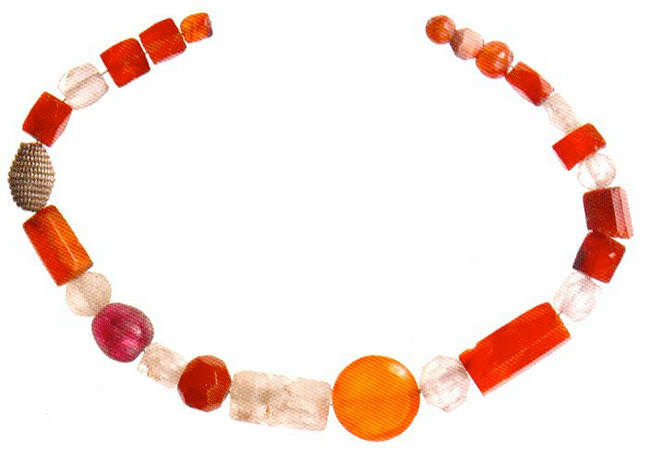 Among the Truso numerous finds is their natural treasure, amber in ornaments especially done for women as below shown amber necklaces and beads of semiprecious stones. Dated from the period the ninth - eleventh century. At the time of Truso discovery, almost simultaneously was the discovery of the cemetery at Weklice dated II - III century AD. 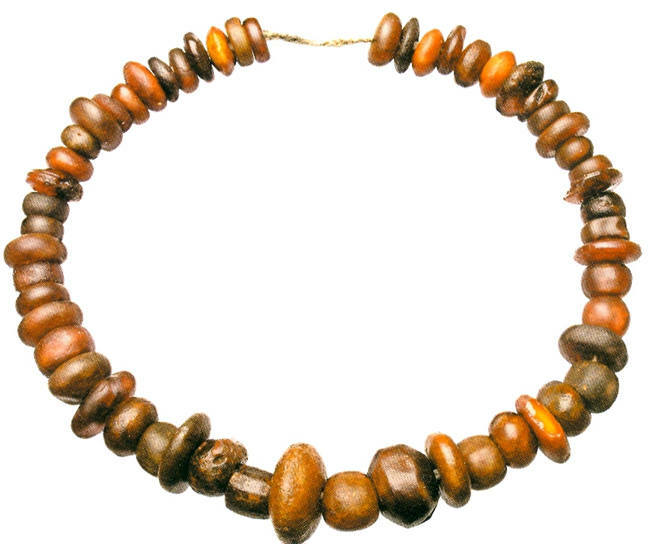 The most interesting, that in a tomb assigned to the Gothic princess, amber necklaces were found. Presented below and compared with the above once, divides them only a minimum of 500 years. How one can explaine the archaeologists theories? Where at this time were Vikings or Scandinavians? Calling the grave of Gothic princess does not opposes the truth, but only that much, further archaeologists knowledge does not go. Knowledge of Goths (more precisely, in this case the Gepids), the Prusai ethnos remains for them an abstraction because it is closer for them to the Scandinavians and Vikings, as well closer to the unknown (they have not yet arrived) Slavs. Just enough to look at the map that between the Prusai settlements they are showing Slavs settlements. Therefore, please let us a bit of history - sometimes it can be linked to mythology, but it should be looked in all directions to seek the truth. Swedes say themselves that the founders of their first port settlement, may have been established by the western immigrants. If it was not the demolition of the Prusai people then perhaps much easier could be for them to accept, that these immigrants were from the south of Baltic, the Prusai. Our archaeologists, in turn, argue that Scandinavians founded Truso. Boys archaeologists should learn languages, and read what others write about themselves. In those days, and in this part of Europe, people lived side by side without any problems, so gentlemen archaeologists do not remove so easily the Prusai. Assuming that those maps presenting authentict, coastal settlements it could be said, but not necessarily, that they were the multiethnic people. 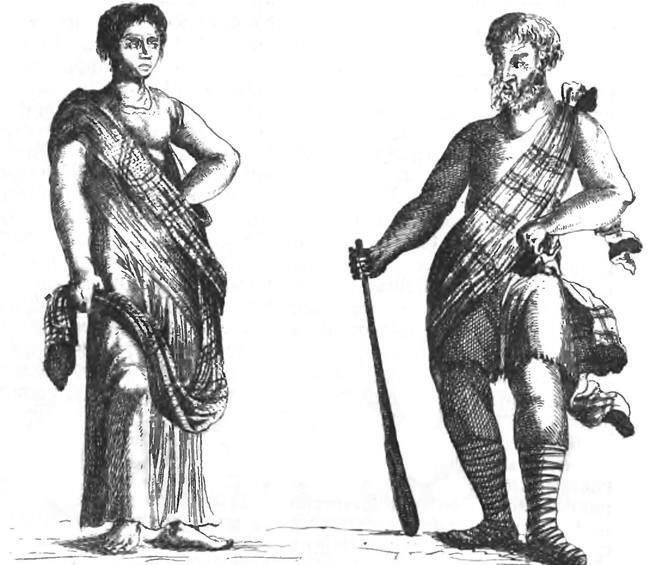 These people were called Widiwarians, because Europe has not yet at that time diagnosised and divided Prusai into the tribes. For certain there was no overcrowding with immigrants, as that would be against the Prusai law. The multiethnic people whose western Prusai people were Gepids lived on the coast, ethnically mixed with others and thus called the Widiwarians. The Gepids themselves the people of the Celtic core, in the trade were a team that relayed the amber from Sambia to the ancient southern Europe. The rest of Western Europe was too barbaric and primitive, to be interested in amber and Slavs did not exist, yet. During the excavation of the gas pipeline through the southern Pomerania, an another discovery was made, in Kowalewko near Naklo by the river Notec - a Gothic cemetery. 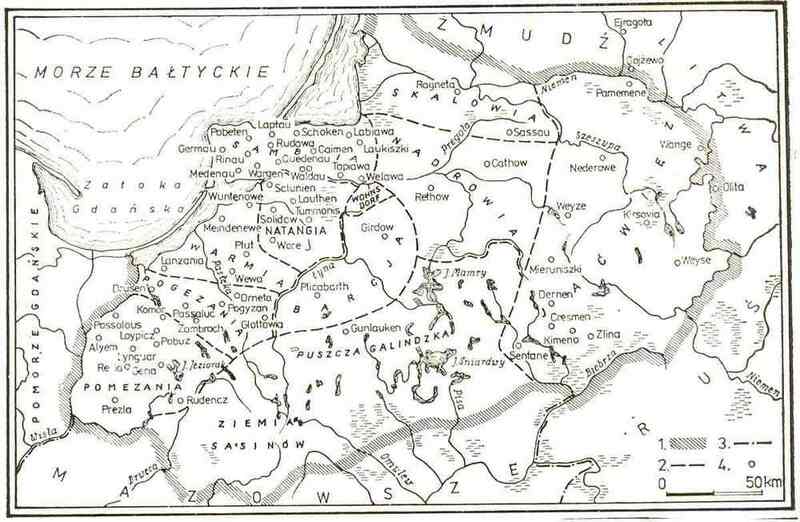 And again, everything indicates that the lower Vistula and Pomerania was the Gotiskandza. Discovery dated to around the second century. 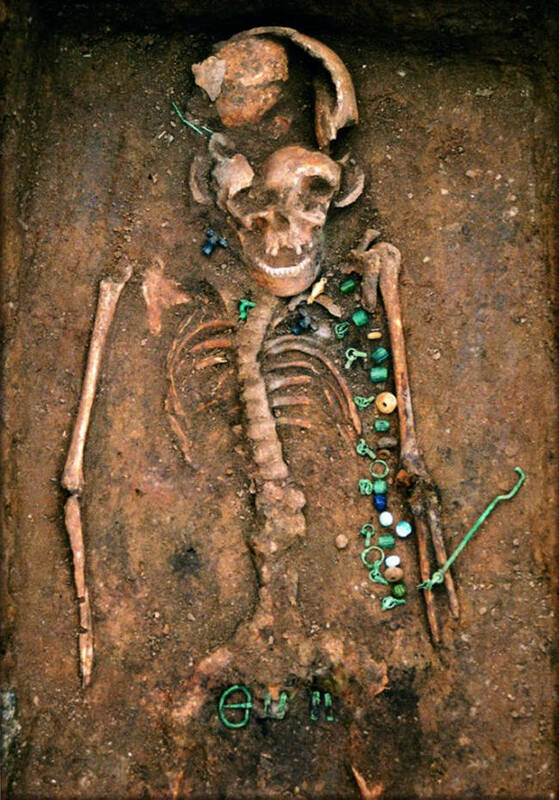 The found grave described as the Gothic princess’, apart from the Roman imports another necklace was found. 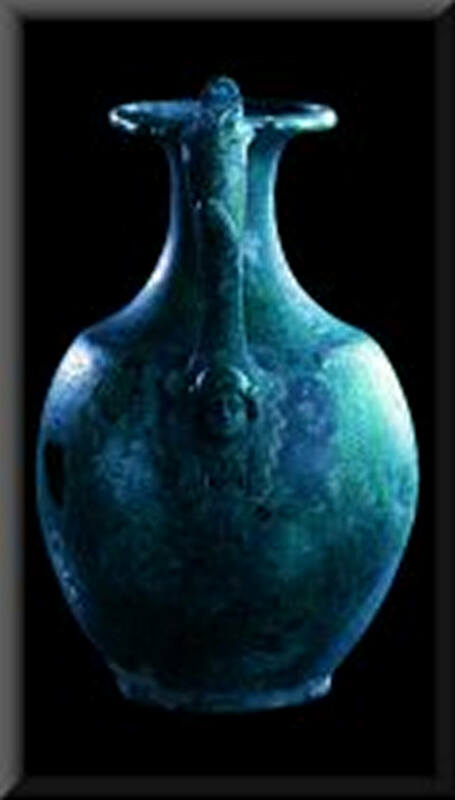 Bronz Jug Greco-Roman dating back III AD. The noteworthy findings are those of the household from very distant places, as well from the different times. 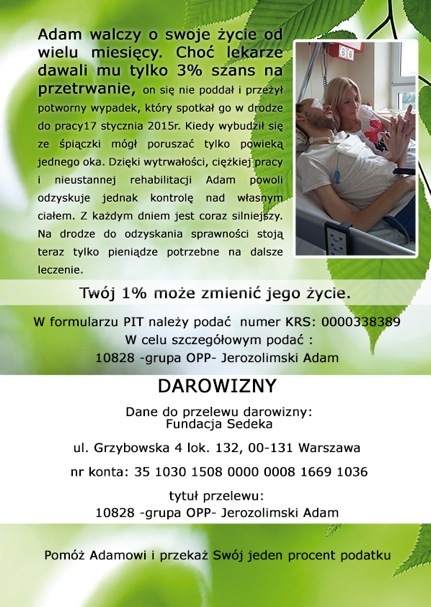 Zubronajcie, Suwalki . Western settlement. Needles and small awl. Bone length of 5, 6.2, 6.5 and 7 cm. 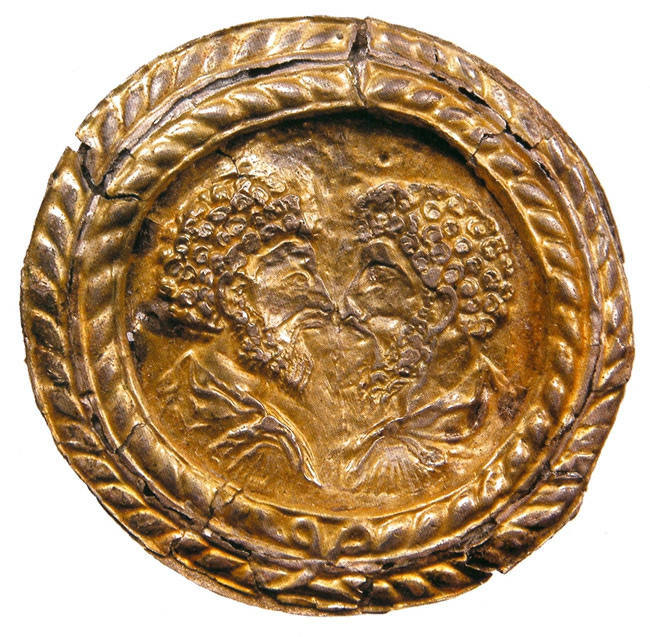 III - II century BC. 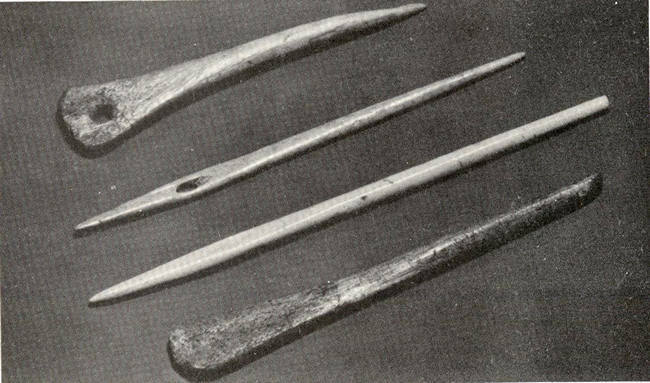 Bone needles. Truso. Length of 4,8-8,5. IX - X century AD. As from the above samples, exposed by the archaeologists and as they stated the period, first one is long before the Truso settlement findings and that supposed to be of the Scandinavian crafts, comparing them, divides them 1200-th years. It follows that either the Prusai were not there at all, or that the Scandinavians were taking lessons from the Prusai. This may prove only one thing: crafts flourished among the Prusai. The art crafts were there for ages and much longer before the archaeologists arrived with their knowledge of Skandinavians and Vikings. It is possible that from the Hedeby, some of the artists were brought to Truso, encouraged with a much better conditions for their existence. Certainly this did not happen in the early centuries as indicated by excavations and the dates because other Baltic ports did not exist. The following other interesting items from excavation on Prusai land. Weapons and tools. 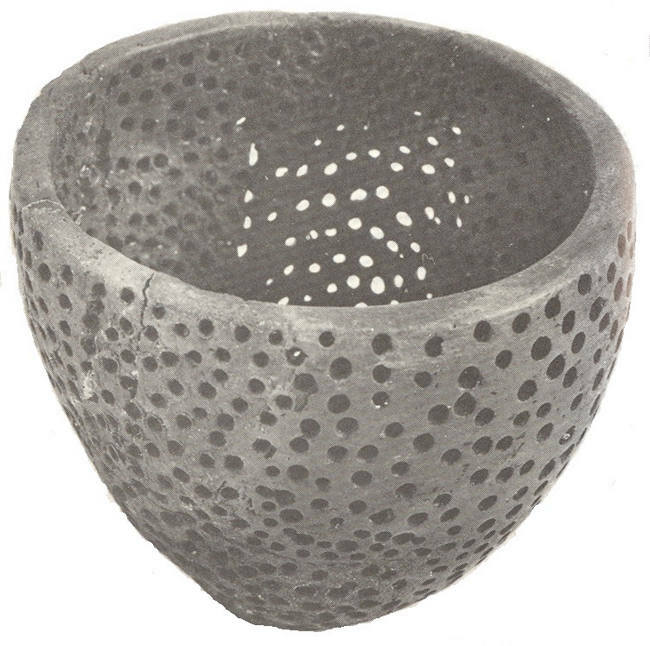 Iron II - III century. 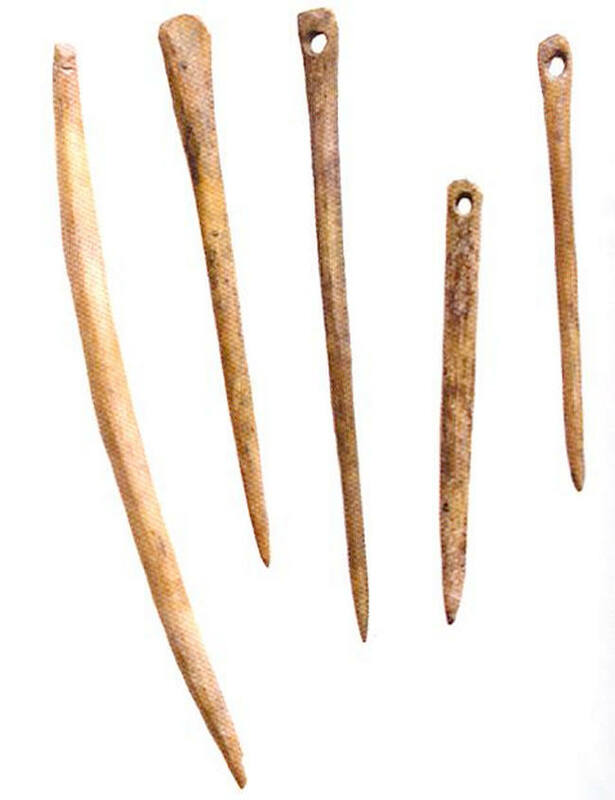 Particular attention should be paid for numerous excavations of the clothe breastpins. 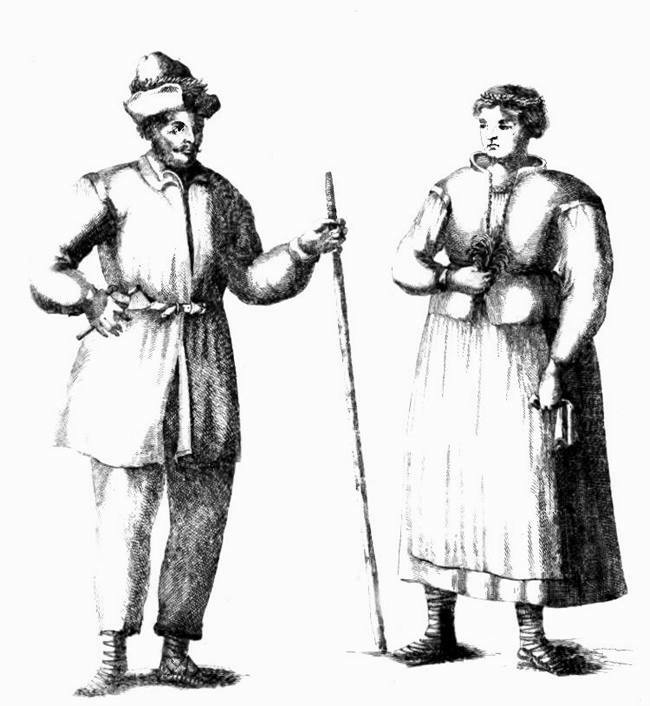 Scandinavians in general did not use them, were dressed much more modestly. Below are samples from the Gothic princess grave. Weklice II-III century AD. 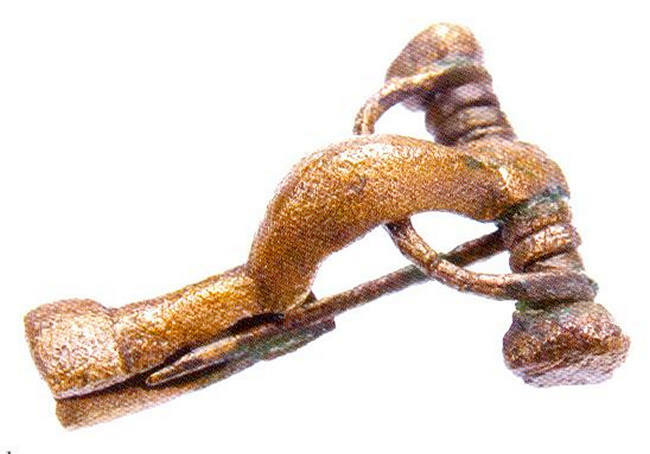 Clips and other items manufactured by the Prusai artists are discovered in hundreds from the other excavations, as seen they are the artifacts spread over the time of ages. Many of them apply only to the Prusai. With some disbelieve, below you will find the Prusai dresses and should be noticed, that clips or necklaces they were essential decorations for such a dressing up. The Prusai girls were famous for their beauties and often for this reason the invading Danes were kidnapping them. Jewelery gave them greater beauty and were most probably very well aware of this. Among the Prusai neighbors, the Scandinavians were very poor in their dressing up, not mentioning others. Without hesitation it can be said, that in fashion the Prusai had also no equals. Their taste and aesthetics was one of the highest standards, it is also a compliment to the Prusai men, who for women appearance, their chosen once really cared. Many times already, it has been mentioned that the wealth of the Prusai, also had no equals in this part of Europe. So who attacked who, and who plundered for who’s wealth? Another theme, very important, the Christianity to all known that it was promoted and implemented by the Germans - in the thirteenth-century, but not many know that it concluded in a genocide of the Prusai people. There are many unsolved mysteries, and it is possible that residual knowledge of Christian faith was much earlier known between Prusai people than between the German kind, and certainly has been a lot earlier than between the Slavs. The Prusai in times of Nero, arriving with their amber into Rome were in contact and saw the Christians, their persecution and martyrdom. How did they interpret it, all this and to-day is hard to say. Also not to be missed, the sixth century the Prusai visit in Rome with amber gifts to the Ostrogoth emperor of Rome Theodoric the Great, and by then the Christians situation was much different. The Prusai were never indifferent in their observations of other cultures as well as of other faiths. These contacts were not only with Rome, also on their way to the world of Islam was the Christian Byzantine Empire. A lot about the Prusai remains unknown, all because of a complete demolition to the Prusai nation by the Germans. To day described as as genocide or holoucast. Nothing survived from them, today only the earth provides us with a residual knowledge. Poor history scientists, they are continously stuck in falsehood, feel sorry for them. 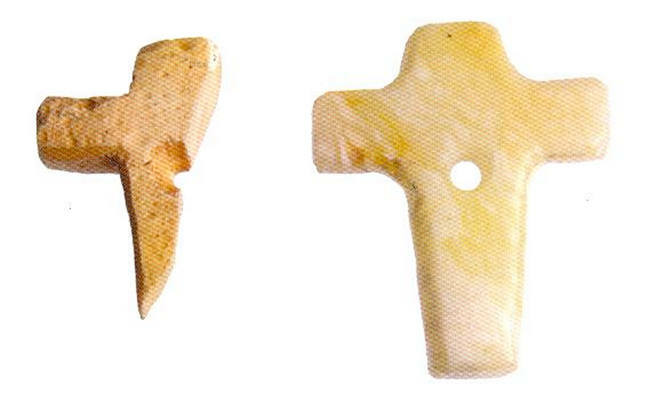 The Truso find, a fragment of the amber cross from X - XI century can attest the existence of the Christian faith at much earlier than the Polish baptism. Since the Prusai made their way in their travels to the Islamic world, been on the Bosphorus, so not only culture, but also the Byzantine Christian faith must have been well known to them. The Prusai Rome visit to Theodoric the Great with amber in the early sixth century is undoubtedly another prove of the contact with Christianity. Especially that Ostrogoths were already followers of the Catholic rite. A fragment of the cross, in addition its reconstruction. X - XI century. Height 2.5 cm, width 1.5 cm. From none of the Baltic ports the Christian religion could have come, as in the then Scandinavian’s faith was crawling, that was about the tenth century. This cross dates back to the X - XI century, but it is not sure, was not earlier? Is it a coincidence or a mistake about which the middle ages writer B. von Henneberg puts "... on the Prabuty wall is a stone with an inscription (erectum) - founded in 1159 ..., this message is given at a glance." Latin could only be known to the missionaries. Another event and the only such one in Europe: missionary Christian in 1216, along with two Prusai chiefs, one of them from the Lubawski (Sasinia) land by the name Survabuna, second from Lanzania Warpode went to Rome, where Pope Innocent III himself, personally baptises them. Who else, what other peoples or persons the Pope personally baptized? Why Prusai? Does not it means, that also were baptized Prusai nation, as in the case of Mieszko king of Poland? And not only that but at the same time the missionary Christian becomes the first Bishop of Prusai people. Up to date, this fact remains without a precedence, and it is very important and at the same time proving, the fact that among the Prusai was not a religious coercion. If this to be meant, all the Prusai can and should proclaim that their nation had the only true democracy that had to be known in the world. Remains the great question: what has happened between 1216 and the next two decades, that the Teutonic barbarians were brought to introduce the Christianity with the sword and not with the cross. Who initiated the conquest of Prusai under the banner of the Christianity ? Christianization of Prusai is the greatest falsification of all the times in Europe's history and obscured for centuries. Always before the word Prus or Prusai first falls the degrading word "heathen" and "pagan" - and further as usually no content, and one does not know what next words to be used, because can not define what is a meaning of "heathen". It's a marketing gimmick of mediocrity for the preservation of this farce. 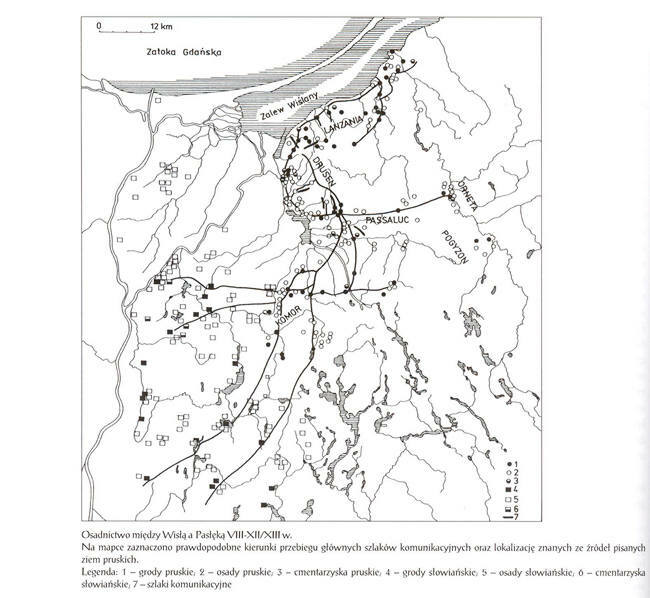 This is a map drawn from the results of archaeological excavations, and shows among the Prusai archaeological finds again the existence of numerous Slavic settlements in the situation when the Slavs were not yet for good settled in Great Poland, Mazovia and Little Poland. The Slavs in the area of Small Poland, Mazovia and Greater Poland arrived only in the sixth-century AD. It is a subsequent archaeological forgery. This creation of continued fantasy, would have meant that in the battle of Pomezans in the year 1234 at Dzierzgon, five Slavic princes with a force of 16,000 strong along with 5000 Teutons clashed against a force of 4000 Pomezans who on this map are Slavs. Definitely it is something new. Continued Prusai "attacks" on the Slavs had therefore been carried out by Slavs who lived in Pomezania - as indicated by the above map. Certainly the incredible information. But good for game. Where is the truth? It is true that from the Slavs, the Prusai could learn nothing much but vice versa yes. Markings of so many Slavic settlements in the so early centuries can only argue about the truth hiding. Polish historians ought to take the learning from the Swedes, who their history hypocrisy of the nineteenth century almost finished with. In Poland it is a common standard, regulation, what for the Slavic Polish history is uncomfortable, becomes inconvenient, unbelievable and undesirable. It's the time to finish with the writing of only the Slavic Poland’s history, it would be very handy, because haze of our history causes biological continuous losses, and that results, as seen in today, lack of the elites to govern the country. The history is always written by the winners, regardless of their intellectual level. In the past for the correctness writing one lost his head, to day, in the times of consumption are losing their jobs. In conclusion, a few words of mine just me. Poland is a country with which I am associated with its culture and I am her citizen. My National Identity: I am Prusai. Poland ows a lot to Prusai: received from my nation very much: culture, loyalty when the Polish culture had to be defended, celebrities that brought her fame, and above all in her borders has Prusai land which now is being in trading. I laugh in the face of all governing bodies, historians and archaeologists who negate the truth about the Prusai nation. I know that I am a winner, because such is the law of the truth, because the Prusai arise like a phoenix from the ashes so the truth about us will win.